Here we are, standing in front of the entry to BlizzCon. All the saving. All the sacrificing. All the trips to and from have lead to this. Liz has to work in her capacity as a journalist so she leaves Ashley and I to walk through the doors into the convention center. "Trust me on this," says Liz, as we part. 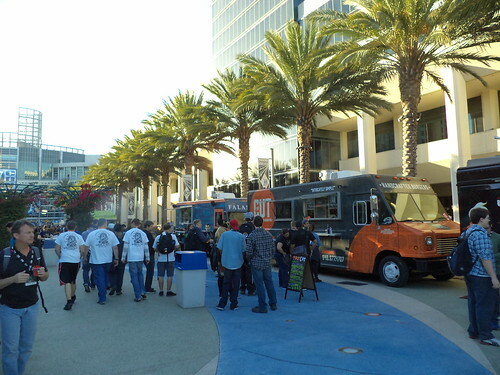 "Eat at the food trucks outside and not at any of the convention spots inside. Convention food is nasty." With this echoing in our ears, we sit through the opening ceremonies. Ashley is meeting a friend for lunch so I wander off to look around. It's now close to 12:30 and there is a panel discussion coming up I want to hear. Food is everywhere at this convention, everywhere. But remembering Liz's comment, I go outside. Holy food trucks, Batman. Looking toward the convention center, this is part of the trucks on the left. And here is the same spot on the right. There were at least a dozen behind me. 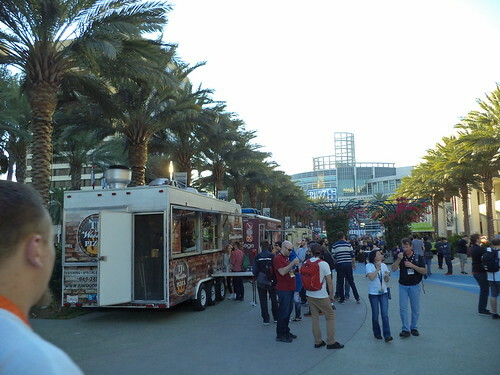 It is a great way to provide food for the 25,000 convention attendees. Add staff and BlizzCon employees and a small city of close to 30,000 develops. There's just no way to have enough hamburgers and hot dogs inside. 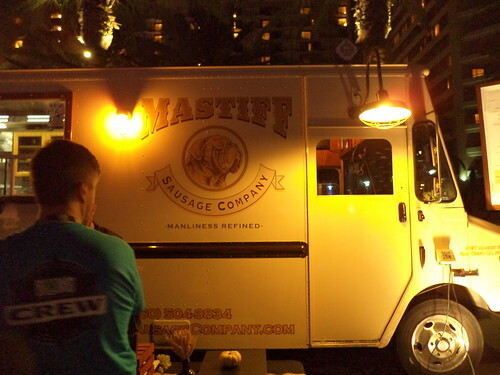 If you have any sort of dietary restriction, you could find a food truck catering to that. 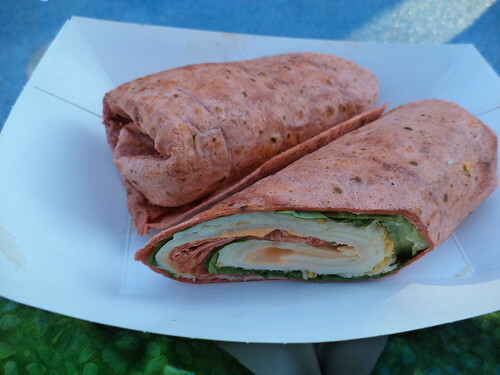 On Friday, after walking up and down and looking at the dizzying array of choices, I settled for a turkey wrap. Turkey, bacon, cheese, lettuce and a mild sauce in this flavored tortilla. The size is deceptive in the photo. It was cut in half and was bigger than my hand. It was $12.00 with soda. That's the thing about the food trucks. They were not "cheap" by any means. But the sheer size made the amount of food comparable to, say, my usual lunch fare of a Subway foot-long with chips and drink; $10.00. I don't recall what I had for dinner on Friday night. I don't have a photo record of it. Onward to Saturday. Liz left early so Ashley and I ate the free buffet at the hotel. It was standard stuff; muffins, waffles, cereal, pastries, yogurt, bacon and beverages. She'd not been able to connect with her friend for lunch on Friday so they arranged to meet on Saturday. We did a couple of things in one of the areas of the center and I wanted to see a program starting at 1 p.m. Ignoring Liz's comment about convention center food, I stopped at a stall selling orange chicken. You know, this was pretty good. 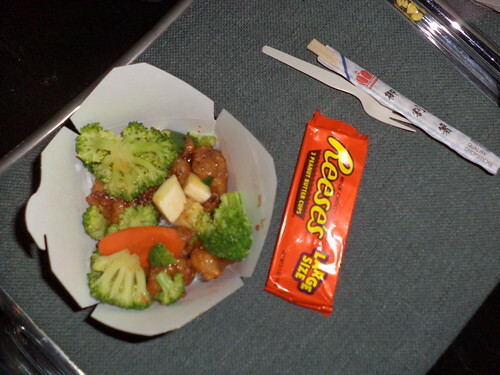 The candy bar was 2.5 times what I'd pay in the store, but the orange chicken was only $6.99. I got a bottle of water and picked at it for the next hour during the program. There was almost too much food in the container. Ashley and I attended a session at 2 and then we split up again. Three thirty California time is 5:30 my time and my Hawkeyes were playing Indiana. I had asked my Facebook friends and family to post updates on the score, since I knew I would be otherwise occupied. I dashed back to the hotel room, popped on the TV and was able to post an article to my guild's web site while watching the last 5 minutes of the game, which Iowa won. That respite, where I was able to put up my feet, left me energized for one final pass around the convention. I headed back and decided to try my luck with another food truck. I met Ashley; not planned, we just happened to see each other; and decided we'd eat off this truck. The fare looked good. They had bratwurst. Ohboy ohboy ohboy! How can you go wrong with a solid hunk of sausage. Ashley got a bacon wrapped hot dog. We got our sausages and sat down. 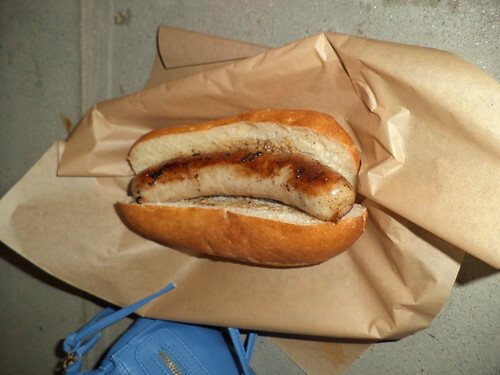 I don't like sauerkraut which bratwurst is usually served with. But cover it with a good German mustard and I'm deliriously happy. This was awful. I don't know if it was because I'm used to Wisconsin brats, i.e. Milwaukee made, or what it was, but it was just not good. I could only eat half of it. I hated to throw away what amounted to $6.00 for the half I didn't eat, but I just couldn't finish it. That, really, was the only bad meal I had. On Sunday, we had reservations at Ariel's Grotto for breakfast. 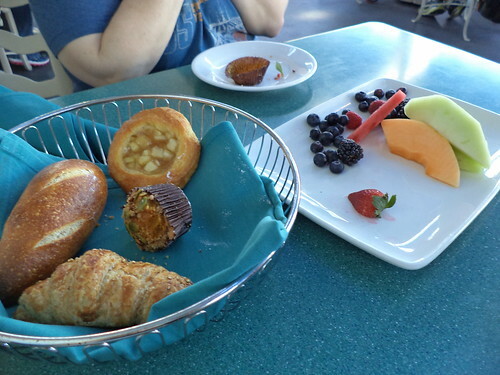 The meal started with hot cocoa and a fruit and pastry basket. We sort of snarfed them up before I could get a photo of the basket. Suffice it to say this was a hit. The menu is fixed. You're handed a card and you order off that. It's not buffet. I had waffles this go 'round of breakfast. 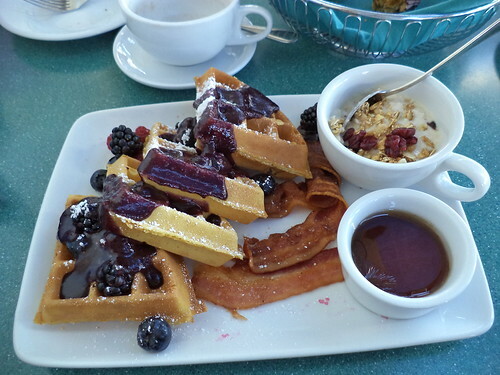 That's a muesli mix at the upper right corner with bacon under my waffles. One thing Liz pointed out which I had not realized, every restaurant we went to did not have water out on the table. That's something we take for granted in the Midwest. You sit down and you're brought a glass of water. With Southern California in a terrible drought, that kind of thing wastes a lot of water because you can't just pour it back into the pitcher for the next guests. So water is provided on demand. We were out on the terrace of the restaurant, overlooking a lagoon. We quipped that the waiter would just take a bucket and drop it over the side to haul up water for us. This was a lovely breakfast. Various Disney princesses wandered through the meal, including Rapunzel, who is Ashley's favorite. 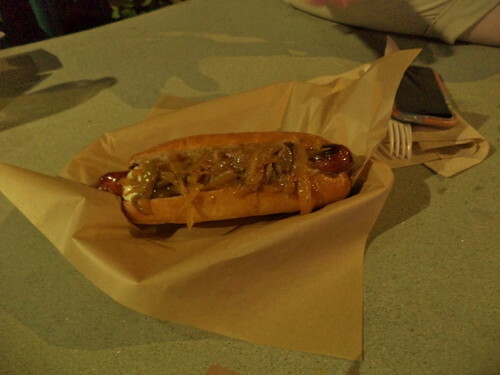 While the food was good and the atmosphere nice, I far preferred Goofy's Kitchen and the buffet. I'm glad we had a chance to do both. The evening meal was a small affair over by the haunted mansion. Cafeteria style, you grabbed a tray and walked around selecting items from a variety of stations. 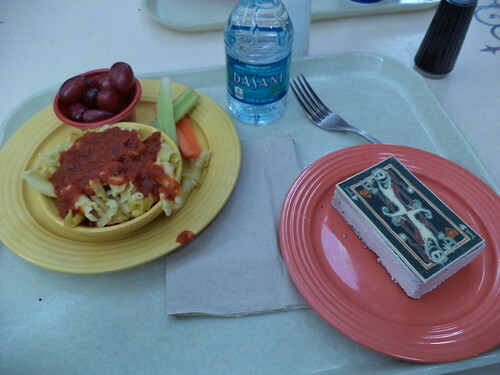 I got the kids-size pasta because it came with fruit and veggies, and a chocolate cake. Both were adequate. Later, I got a bag of popcorn and ate that while watching the pyrotechnic show and the fireworks. This was okay and a decent value for the cost, but I was tired at this point so the cake seemed dry and somewhat flavorless even though it was chocolate. The next day was get away day. I grabbed breakfast at the airport; a large blueberry muffin and tea. My flight was delayed getting out of LAX and I couldn't bring myself to pay the price asked for what seemed like substandard fare aboard the aircraft. When I finally got home, I had soup and a ham and cheese sandwich. Vacation food can be iffy. All-in-all, I had one lousy meal. That's not too bad of a track record for all the times I ate something. 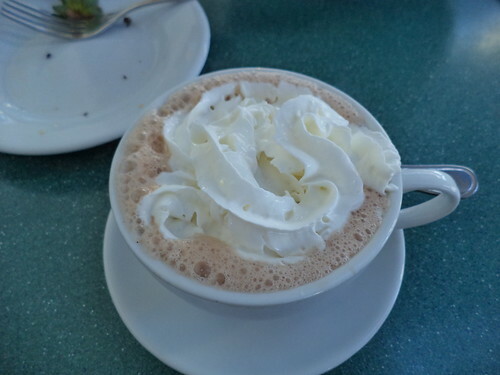 Uninspired meals were breakfast at the hotel, at Starbucks, and the final meal at Disney. Adequate meals were Sunday breakfast and breakfast at both airports. The meals that surprised me were the convention chicken, the sandwich on Friday and Thursday's soup at Rainforest. The other meals, Cafe Orleans, Goofy's Kitchen and good ol' IHOP, were amazing. I think I should try to make that peanut butter and jelly pizza. I'll let you know how that goes. I'm Not Afraid -- What Am I Doing Up Here! ?